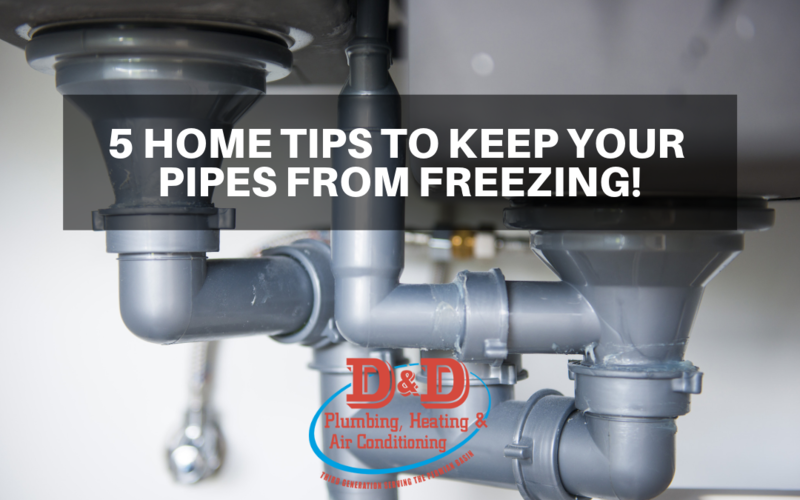 5 Home Tips to Keep Your Pipes from Freezing! Along with the arrival of winter and its frosty temperatures is the potential for freezing pipes. A frozen pipe, whether a water or sewer line, will block the flow inside your pipes and either backup inside your house or burst from the buildup of pressure. The disastrous effects of a bursting pipe can be costly in a wide variety of ways including your pocketbook. You can avoid this potential damage by considering one or several of these 5 home improvement projects. Pipes tend freeze in areas where they are most exposed to outdoor temperatures. Those areas include walls, attics and crawl spaces where water lines either enter the house or lead from one area of the house to another. A professional plumber can help you identify areas where the water lines in your home might be exposed to outdoor temperatures and advise you on the necessary R-values to prevent freezing from taking place. An alternative to beefing up the R-values of entire areas of your home is targeting specific areas and specific pipes that are most likely to freeze when outside temperatures dip below freezing. Plumbing professionals can not only help you identify those pipes with the most potential for freezing, but can also help you install the right type and right r-level of insulation around those pipes. Though a more drastic measure, another answer to eliminating the problem of freezing and bursting pipes is to reroute plumbing to interior walls where they are not exposed to extreme temperature drops outside. If you are in the process of constructing a new home or going through a remodel the pros at D&D Plumbing can be a great asset in routing your plumbing to interior walls where the potential for freezing can be eliminated. Though the most damage to your home often comes from pipes bursting inside your home, a pipe bursting outside your home can also cause some pretty significant problems. The most common reason that pipes burst in your yard or driveway is because they are not buried below the common frost line or freeze depth in the region where you live. By contacting a professional plumber to determine the proper depth of the water and sewer lines running into and out of your home, you can head off this potential disaster. Heat tape is another means of preventing pipes that are exposed to outdoor temperatures from freezing. Heat tape or heating cable is a specialized kind of flexible cable with conducting wire inside, which becomes hot when electricity flows through it. Heat tape is typically wrapped around pipes that are located on an outer wall or in an area where there is a high potential for freezing. There are various types of heat tape available including self-regulating, non-regulating and automatic electric heat cable. A professional plumber will help you determine which type of heat tape will best serve your needs. Freezing pipes can have a disastrous effect and cause a lot of damage. You can prevent both by considering one or more of the 5 home improvement projects listed above. D&D Plumbing, Heating, & Air Conditioning is an essential resource near you to help you maximize the effectiveness of the home improvement projects you choose. D&D Plumbing Heating & Air Conditioning’s mission is to continue growing as an industry leader in the business of servicing the needs of the light commercial and residential sectors within the surtrucand tion Rotans who take a tremendous amount of pride in your total satisfaction. Every month D&D Plumbing, Heating, & Air Conditioning picks a winner from our fans who are signed up for our newsletter and Facebook page.